The new X4 Camelots are BD's latest addition to their 4-camming device collection. They claim that they are great for everything from big-wall to your basic day-to-day trad climb. So do they hold up to expectations, can they be a replacement for the classic C4's, and how do they compare to the ever popular C3's? I have nothing to base this on other than my own experience, but I think that most folks stick with the brand of trad gear that they first learned to lead with. At least that's they way for most of my friends. Part of that is probably that you get used to placing gear based on size, and the different cam manufacturers make their devices in different size ranges. If I look at a small crack, I almost instantly know if it's going to take a .25 or my green Alien. If I go climbing with folks who have, for example, a set of Master Cams, and I lead a pitch I often find myself misjudging the piece I want for a particular crack. It's very annoying. When I started climbing my first trad leader had BD Camelots, and that's what I've stuck with ever since. I've tried a few other brands, but honestly I couldn't find enough of an advantage to warrant making a change. The only odd cam that I added to my rack was the afore mentioned Alien green Alien. It was just the perfect size for fitting into pin scars in granite. At the time BD didn't have anything that fit that exact dimension. Last year BD released their X4's. My set of Camelots were getting a bit long in the tooth and I decided that I would give them a try, replacing all the applicable sizes and adding the .1 and .2 to my arsenal. The first thing I noticed about them was the single stem with the aluminum "armor beads" for protection. The smaller sizes use their Stacked Axel Technology" to give them a wider range in smaller sizes. All are somewhat narrower than their original counterparts. Over the past 10 months I've use my new set of X4's in all kinds of situations. I've climbed slab, cracks, steep face, overhanging - pretty much everything. As you know, I'm based here in North Conway and climb mainly granite, I have used them twice at the Gunks and at a variety of other small crags in this area. While I readily admit that I haven't fallen on them, I have hung on them at times and used them as a part of top rope anchors. I did notice the flexible stem getting a little bent once or twice, but a little tweaking in the opposite direction easily corrected it. Two of my friends have full sets of the C4's and I've used them a fair amount. The 5 pieces from 000 to 2 C3's cover about the range of the 4 .1 to .4 X4's. The C3's have a semi-rigid'flexible stem that's protected by a hard-plastic outer covering. They place really well and if you climb a lot of thin cracks, they may be the ticket. I'm not sure that they are necessary for me, considering what I usually climb, and I just don't feel that I'm really missing anything by only having the X4's. Conclusion: I really do like the X4's a lot. 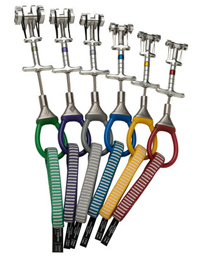 They are easy to place, have a very smooth action and cover the ranges that I need for my climbing. Coupled with a set of recent C3's from 1-3 and an older #4 that I rarely use, there hasn't been anything that I can't do. I guess I should say that there isn't anything that the gear has impeded me from doing. Details: Weight: From 1.8oz for the .1, to 4oz for the .75.